Stretching is one of those words and activities that we know of, occasionally use, but don’t give it much importance. Stretching is for anyone who experiences physical restrictions or tight and painful muscles. Stretching is for anyone who plays sport, exercises, sits at a desk all day, uses their muscles on a daily basis….everyone. · Increase circulation to muscle fibres, improves mobility in and around joints and increases flexibility. · Lengthen and mobilise muscle fibres, thereby easing tendons. · Treat and prevent injuries. Stretching is best done before any physical activity, especially if you are feeling stiff or in pain, but most importantly after the activity is over when the muscles are still warm. Stretching can and indeed should be done during the day to ease any postural aches and stiffness, to mobilise the back and neck areas. So whether you are a runner, gym-bunny, desk-jockey, manual worker, mum or dad, understanding how stretching can help you and knowing what stretches are available, will make a huge difference to you…guaranteed. Follow this link to my Stretches on You Tube http://www.youtube.com/user/simonheale#g/u although aimed at runners, most if not all of them can be adapted for any muscular need. If you are preparing for a physical activity: run, bike, swim or hike. If you sit at a desk all day and experience regular pain and stiffness. If whatever you do all day: driving, studying, carrying your children, lifting things, massaging, is causing pain or stiffness. Regular, effective stretching, combined with some Deep Tissue Bodywork will alleviate pain and stiffness, improve your flexibility, health and vitality. 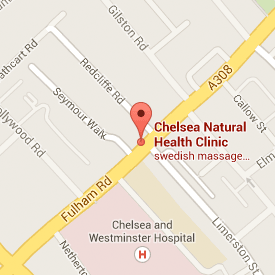 Simon Heale is co-Director of Chelsea Natural Health Clinic, a Remedial and Sports Massage Therapist, Hypnotherapist, Cranio Sacral Therapist and Reiki Master.